Chicken Satay with Peanut Sauce is one of my favourite dishes and I have been making this recipes for decades. Whether you write it satay, sate or saté, people love this Indonesian specialty. Delightful little skewers of juicy cooked meat served with a creamy peanut sauce. If you love the taste but think the skewers are too much effort I’ll tell you the hacks I use for an everyday version of this satay recipe. I have fond memories of eating chicken satay with peanut sauce on the island of Bali many years ago. Every day was a sunny 32°C with a warm ocean breeze. The narrow streets were dotted with food vendors fanning the grill on their satay cart to keep the heat at the perfect cooking temperature. Each vendor, like the one pictured here, had their own variation of satay and their own style of serving it. The most memorable one was watching the vendor swiftly blob peanut butter in the center of brown butcher paper, squirt hot sauce onto it then mix the sauce right before my eyes with two skewers of meat hot off the grill. He folded the paper around the meat and handed me a package of the most delicious, succulent chicken satay I had ever tasted. All these years later I think of that moment every time I make this recipe. There are two specialty ingredients in this recipe, kecap manis and tamarind. Kecap manis, sometimes spelled ketjap manis, is a sweet, thick Indonesian soy sauce. Any purchased kecap manis I have seen contains wheat so you have two choices. Make it from scratch using gluten free soy sauce or substitute. I wrote this substitute in the recipe although I have never tried it. The suggestion is to replace the full amount of kecap manis with gluten free soy sauce then and a bit of brown sugar. Making homemade is the other choice and that’s what I do. When I started to cook gluten free I pulled out this old recipe for homemade kecap manis and just made it. It lasts in the cupboard forever but the idea is to use it so I’ve given you two more recipes to do that at the bottom of this post. Tamarind refers to the pod of the tamarind tree which contains seeds covered by a fleshy pulp. It adds a unique fruity sourness to many dishes and is naturally gluten free. It is available in Asian and Indian specialty shops sold as tamarind concentrate, a thick dark paste in small plastic tubs or as tamarind pulp, a pliable block wrapped in plastic. 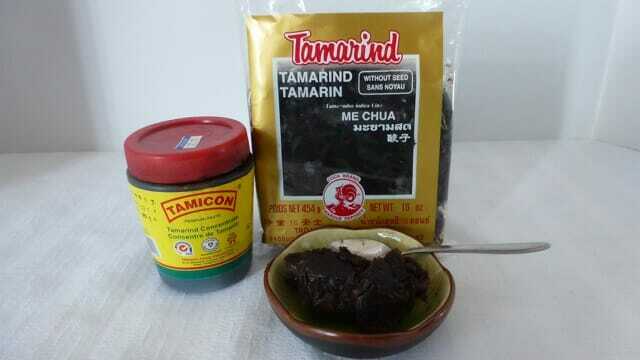 For more details on using tamarind have a look at my post titled Tamarind Concentrate vs Tamarind Paste. In the comments below I’d love to hear what you did with your satay. Soak wooden skewers in water for at least 4 hours. Cut meat into small pieces and place in large container or bag for marinating. Using a food processor or immersion blender combine all marinade ingredients and process to a smooth paste. Pour over meat and marinate for 1 hour at room temperature or overnight in the fridge. Thread meat on skewers. Cook on the barbecue or under the broiler until done, approximately 6 minutes depending on the size of the pieces. Serve with peanut sauce. In a large glass measuring cup combine peanut butter, kecap manis, garlic, brown sugar, lemon juice and hot pepper. Add the boiling water and whisk until smooth.Keeps in the fridge for 1-2 weeks.